Most retailers and wholesalers require suppliers to assign a unique numerical identifier to every product they sell. However, the numbers can't be the supplier’s part numbers – they must adhere to a global standard of identification, and each product number must be globally unique. It was this standard that brought about the use of worldwide UPC and EAN barcodes. In the United States and Canada, the product identifier is the UPC (universal product code) number, also known as GTIN-12. A UPC barcode consists of two components: a company prefix and a product number. Outside the U.S. and Canada, the product identifier is the EAN (European article number), or GTIN-13, which is a superset of the 12-digit UPC barcode and accepted anywhere in the world. 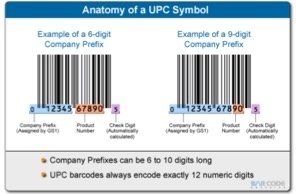 The following provides a detailed breakdown of UPC barcode elements. (Image sourced from GTIN Info: https://www.gtin.info/upc/). 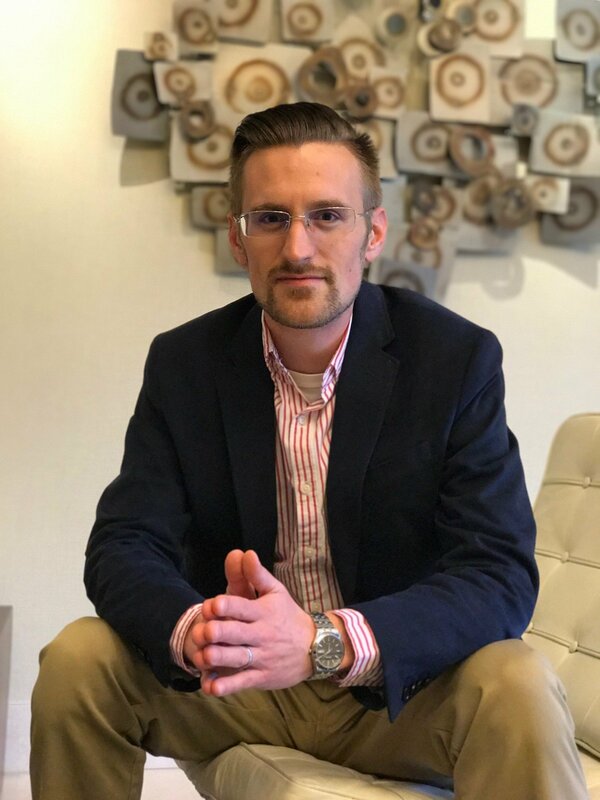 Most U.S.-based companies use their UPCs for global trade, as they are readable in any country where the EAN system is in use; the only time a U.S.-based company needs a specific EAN is when that company only sells its products outside the U.S. and Canada. Note: Both the UPC and EAN standards have gone through recent changes. The EAN is now known as the international article number, and both the UPC and EAN standards have been incorporated into the GTIN (global trade identification numbers system). The numbers encoded into barcodes are GTINs while the type of barcode is UPC or EAN. You can’t create UPC numbers and stick them onto your products; without an assigned company prefix number, your numbers would be unreadable by barcode scanners and point-of-sale systems. 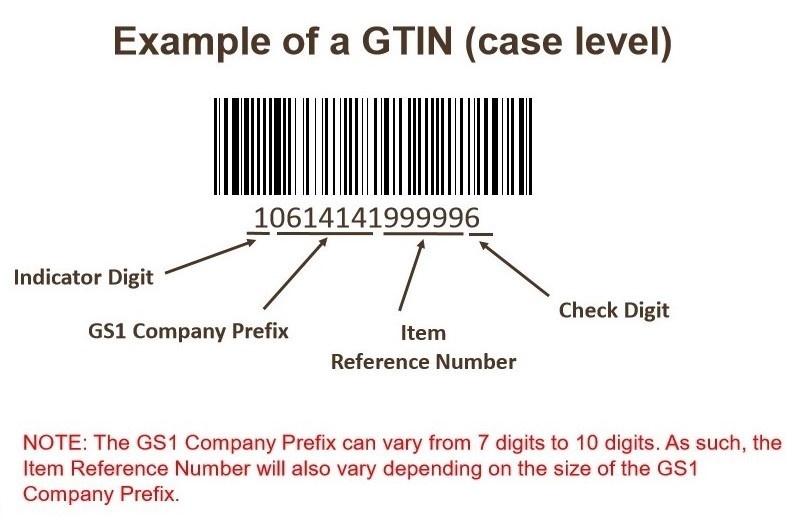 The only way to obtain your official company prefix is to have it assigned to your company directly by GS1 US, the organization that oversees the entire GTIN system worldwide. No other organization has the authority to sell you a company prefix, so avoid scams by purchasing directly from GS1 US. Numerous websites offer “single-use UPC barcodes” (without a company prefix), claiming they’re a cheaper, faster alternative to the process with GS1 US. Some are legitimate, but because you’ll be hard-pressed to find retailers that accept UPC/EAN barcodes without a company prefix, it’s best to stick follow GS1 barcode standards. How Many Barcodes Do You Need and How Expensive Are They? You need a barcode for each product you sell. That seems simple when you think, “Ok, I sell 80 products, so I need 80 barcodes.” However, GS1 US standards say that a “product” includes packaging variations, so if you sell a widget in a 2-pack, 6-pack, and 12-pack, you have three separate products, each needing its own barcode. Following is the pricing directly from the GS1 US website’s pricing page. 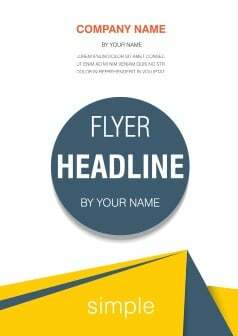 The initial fee gives you the company prefix for one year. After that, you’ll pay the annual renewal fee to continue using the GS1 US-issued company prefix for your barcodes and product identification. Carefully consider your barcode volume needs, accounting for costs from GS1 US as well as future growth in product variations. GS1 doesn’t allow you to exchange your existing company prefix for a new one to accommodate a number of barcodes higher than what you initially licensed, which means you’ll have to purchase a new company prefix. The issue with that scenario is not just cost – managing your products under one company prefix is easier and more efficient. Fortunately, GS1 provides a convenient set of tools to help you calculate your current and anticipated barcode needs here. 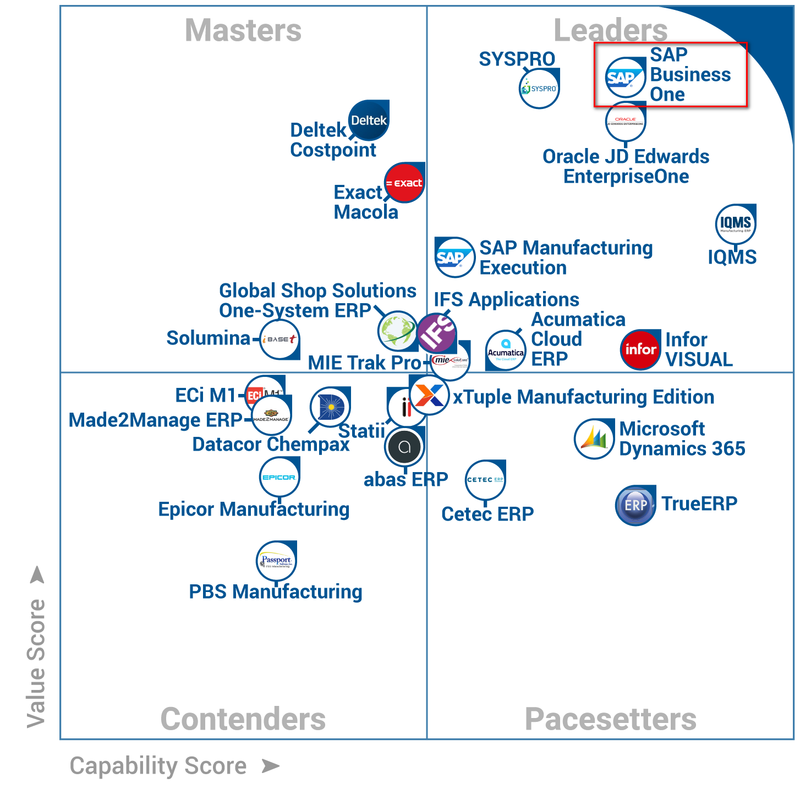 SAP Business One listed at #1 Frontrunner for Manufacturing Products by Gartner.